Friends of Mulligans Flat carry out work to assist the ACT Parks and Conservation Service and the Woodland and Wetlands Trust in their management of Mulligans Flat Woodland Sanctuary and the broader Mulligans Flat Nature Reserve, adjacent to the suburbs of Throsby, Forde and Bonner in Gungahlin. Volunteering with us offers unique opportunities to work on a ground-breaking ecological restoration project. Mulligans Flat Woodland Sanctuary was established by the ACT Government in 2009 with the construction of a predator-proof fence encircling 485 hectares of critically endangered Yellow Box-Blakely’s Red Gum grassy woodland, with the aim of eradicating feral animals, reintroducing native species, and restoring the ecological health of the woodland. The Sanctuary has recently been expanded to protect over 1200 hectares and a Learning Centre is planned in the suburb of Throsby. Our Friends group hold work parties with ACT Park Rangers on the second Wednesday of the month (9.30-12) and occasional work parties on Sunday mornings (10-12), usually every season. We meet at the Woolshed inside the Sanctuary which is a 10 minute walk from the closest parking area on the eastern loop of Eric Wright St, Forde (follow the signs to the Main Gate; the Woolshed is a further short walk up the Main Loop Road). Please wear appropriate clothing including covered shoes and a hat, and bring water – morning tea is provided. Activities may include weeding, erosion control, or fencing. Our volunteers can also sign up for a diverse range of opportunities with Trust ecologists, such as wildlife surveys, turtle and hatchling patrols, and assisting with public programs. You can register with the Friends of Mulligans Flat here https://mulligansflat.org.au/get-involved-2/. We encourage our regular work party volunteers to also register via betterimpact with the Parkcare hub to record your volunteer contributions and access further opportunities through the Parkcare network. The Friends of Mulligans Flat have had another busy year. We now have around 550 Friends signed up, with the majority just maintaining an interest in what is going on. However our 40 – 50 active volunteers continue to contribute hugely to the Mulligans Flat Wildlife Sanctuary by helping out with PCS park care activities as well as with the Woodland and Wetland Trust activities. 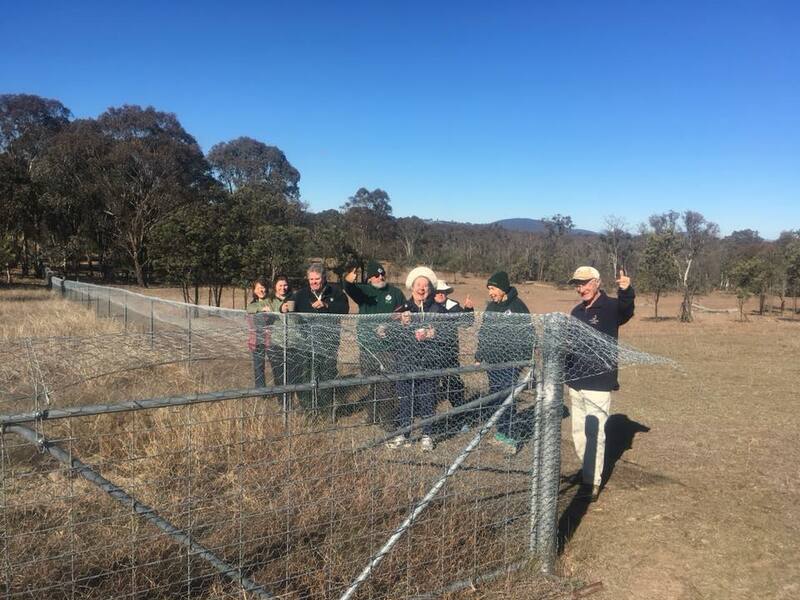 With the new predator fence nearly completed there is now another 800 hectares to help look after, so the Friends ventured into Goorooyaroo to assist the Rangers in mapping out rabbit habitat. Hopefully the rabbits and other exotic pests can be removed quickly to allow the extended sanctuary to reach its full potential. The Friends are also looking forward to the completion of the new Education and Learning Centre, the new “gateway” to Mulligans Flat in the Throsby suburb. This centre will introduce a range of new activities for our volunteers, similar to what occurs at Tidbinbilla. Our monthly work parties this year included some quite different activities. Within the current Sanctuary there are a number of bettong exclosures. These small one hectare plots are “control” sites to determine how the bettongs constant digging affects the soil profile. But nobody told the bettongs that they can’t climb the meter high fence! So under the guidance of Ranger Dave and his team the Friends helped fit an experimental “floppy top” to one of the exclosures. Time will tell how successful this is – echidnas still try to get into the exclosures and the wily bettongs soon follow!!! Once again this year the Friends have flocked to participate in the turtle patrol and for the annual echidna count. For the third year in a row the echidna numbers appear to be in the low 50s, so there is a growing confidence in the method used and the number derived. A new activity this year is monitoring some key dams to gain an insight into turtle nesting numbers, with the aim to hopefully capture emerging turtle hatchlings for relocation to other key sites in the region. Foxes are predating large numbers of turtle nests. Fox control, whilst a very important ongoing project, does not offer sufficient protection as only one fox can potentially predate over 95% of nests. Turtles have quite long lives and their current numbers appear reasonably healthy, but with the reducing number of turtle hatchlings entering the population it is only a matter of time before numbers start to decrease. It hasn’t all been exciting with challenging and new activities! The weeds still grow, and we still continue to keep them under control!